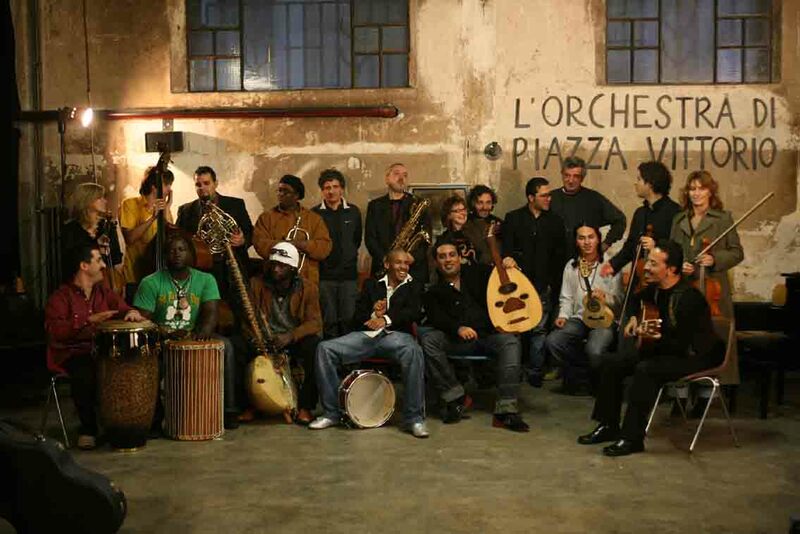 If ‘world music’ could be encompassed by a single group, Rome’s Orchestra di Piazza Vittorio (OPV) might just be it. They are a phenomenon which has sprung out of the city’s diversity; 15 players from 9 countries, spanning continents and cultures, religions and backgrounds, some with music diplomas, others whose education came from busking in the streets. The Orchestra di Piazza Vittorio story began in 2002 when Italian classically-trained composer Mario Tronco joined forces with a group of artists, filmmakers, musicians and writers who were battling to save the Apollo. This old theatre in the Esquiline district was threatened with being converted into a Bingo Hall but the ‘Apollo 11’ campaigned to create a pluralistic cultural hub there. Since the Piazza Vittorio neighbourhood was home to some 60 nationalities at the time, it seemed only right for Tronco to name his eclectic Orchestra after one of the capital’s most vibrant multicultural spaces. That OPV have become an internationally recognised group is an extraordinary achievement. Tronco was once quoted as saying he never expected the group to be self-financing, nor to perform very much. Over 300 concerts and several albums later, and an acclaimed documentary produced by Agostino Ferrente, growing financial resources and an international fan-base, OPV are doing just fine. In July they play their UK debut in London’s Barbican Hall. What keeps this modern medley going? How can a line up which sometimes features over 20 musicians, many of whom don’t speak the same language, function as a travelling band? “How many things can you do with so many musicians, with so many instruments?” retorts Pecorelli. “It’s like a laboratory in which every day you can have an incredible experience.” This is why OPV functions. More than most bands, OPV entirely depend on their raw creative instincts. Music is the only language they can all speak. But for Pecorelli and others, OPV’s music is more than a common language. It is also the basis for a more substantial education. “Every day you get to feel part of the whole world. Physically, I get to travel so much. Musically, I learn aspects of other cultures that you can’t learn reading a book. One day Senegalese, the next Cuban, the next Tunisian. It’s unbelievable!” he laughs. Italy’s controversial 2002 Bossi-Fini immigration law was arguably the start of an Italian political shift towards a Right that continues to celebrate the politics of Mussolini. In May 2009 Italian Prime Minister Silvio Berlusconi said publicly that he did not consider Italy to be a multicultural society. As the Italian state and media becomes increasingly intolerant of immigration, the symbolic power of OPV has become widely upheld by artists, academics and social commentators. OPV have come to represent and embody the enormous benefits that a tolerant, culturally diverse society can bring. The band has spawned a host of imitators across the country. New multicultural orchestras have emerged in Padova, Milan, Trento, Naples, Genova and other Italian cities. Why? Because in Italy OPV now stand for more than simply artistic freedom, but for freedom in the broadest sense, freedom to exist. Can there be a more popular calling?